This 3D periodic table wallpaper is offset a little bit to give the tiles a 3D look. 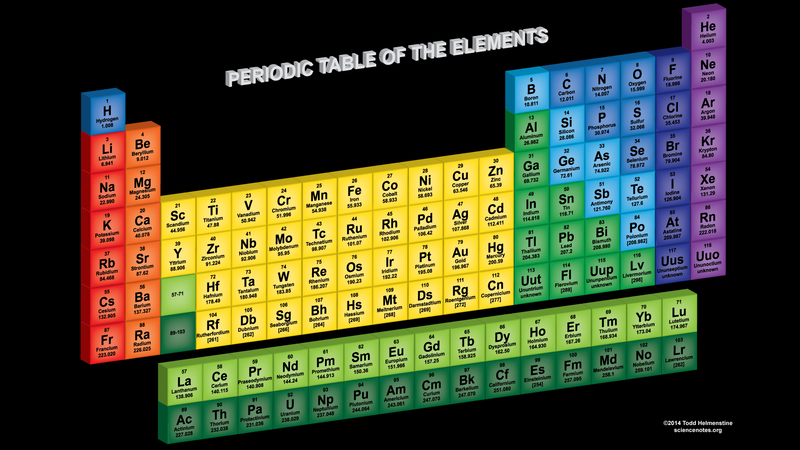 Each tile contains each element’s atomic number, element symbol, element name and atomic mass. Each element group is represented by a different color. This wallpaper is suitable for HD widescreen devices. The resolution of the full-sized image (click the image to see full-size) is 1920×1080. While this table was designed more for an artistic look, the text is still readable on larger monitors. This makes it a useful periodic table along with being an attractive wallpaper. Check out our other Periodic Table Wallpapers.